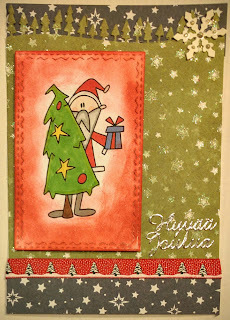 How adorable - I love the star bg papers you used. Thanks for joining our Christmas in July event this week. We hope to see you join in on the remaining days as well. Really beautiful. I love the tree border die you've paired with him. Thanks for playing along with the Bugaboo Christmas in July challenges. Lovely Christmas card, fun image, thanks for sharing at Winter Wonderland this week.